Pegasos flying l.; AGE below. Head of nymph l., hair in sakkos, wearing earring and necklace; EP behind neck. Good VF. 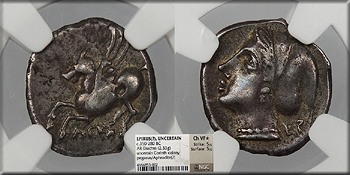 NGC Attractively toned. Extremely rare. Good metal quality. Possibly the third known example. See CNG 36:1911 (misattributed as Agrinion in Aetolia) for what may be the 2nd published example of this type from the same die pair. NGC certified Choice VF*, 5/5, 5/5.